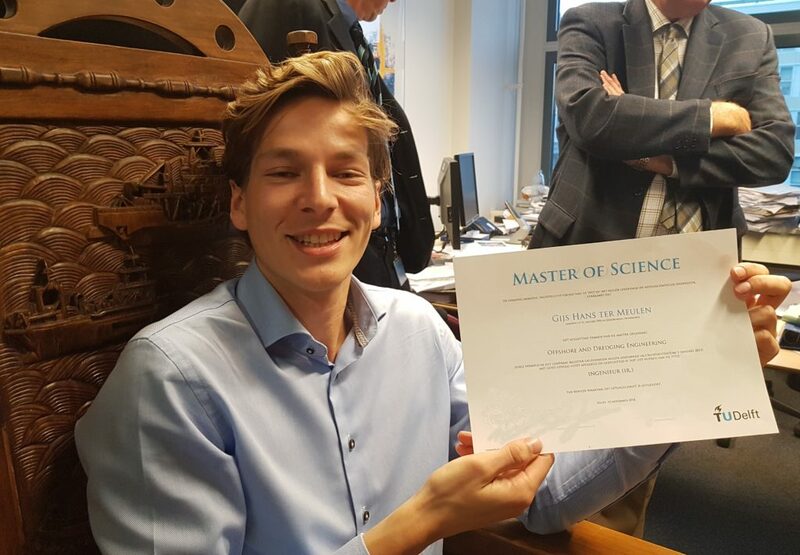 Gijs proudly presenting his MSc. certificate. We have another bright new MSc. 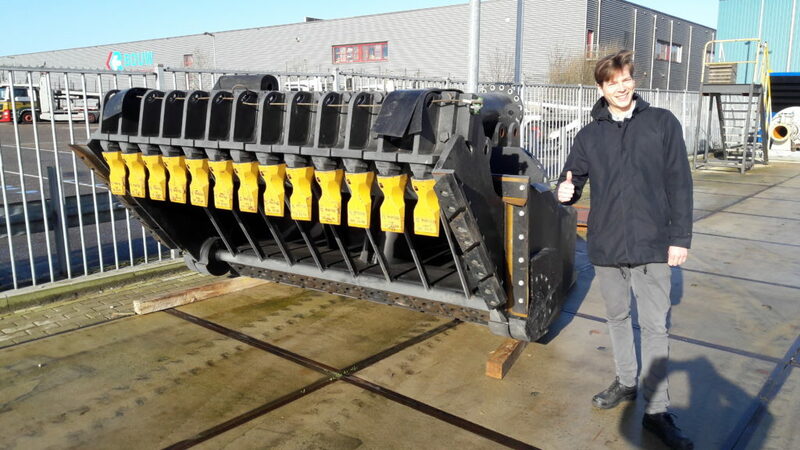 engineer in dredging technology1: Gijs ter Meulen. Tuesday, he presented and defended his thesis on the forces and production of a trailing suction head. 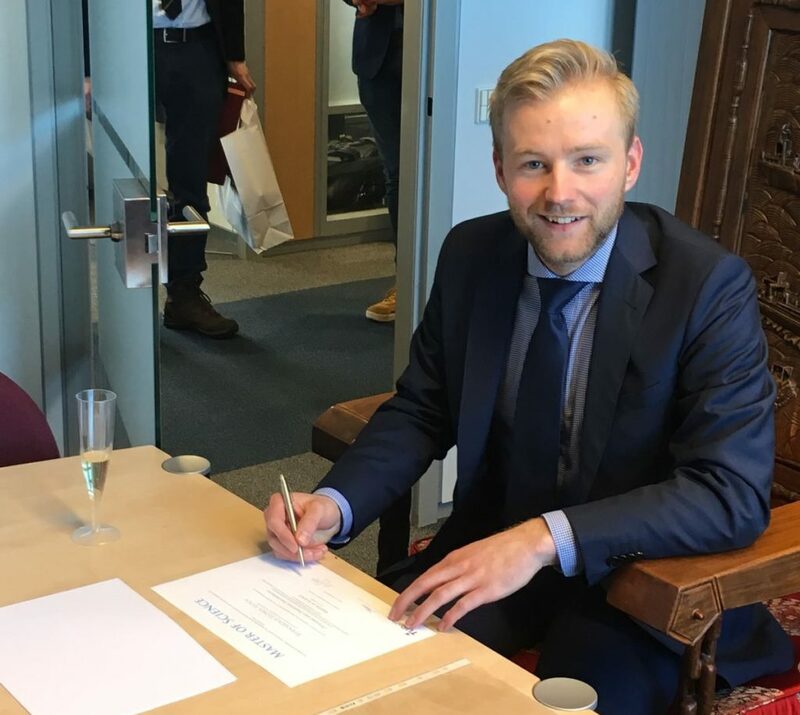 For this thesis project he was working at our research and development department at Damen Dredging Equipment2. 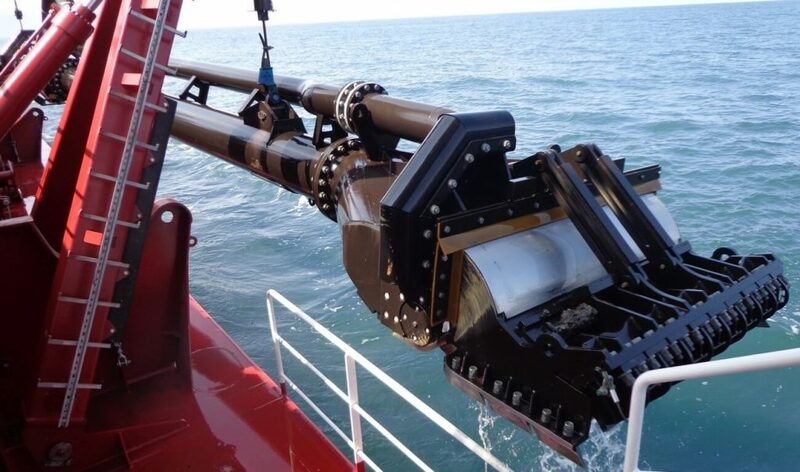 Trailing suction hopper dredges have become the tool of the trade for modern dredging contractors. They are versatile, flexible and able to transport sand over great distances. They load their cargo in their holds, by sucking up the sediment from the sea bottom with a big trailing suction head. This head looks like an out of size vacuum cleaner head. Typical drag head on a railing suction hopper dredge. Usually, it is very difficult to comprehend what is going on in and around the drag head. There is some laboratory research done, but not all results are freely available. Other knowledge is solely based on the experience of well-seasoned dredge masters. I do have respect for the experience of dredge masters, but their stories are hardly usable for an academic model description. So, Gijs took on the challenge to piece together a model, that satisfies our curiosity and fits with the experiences. Concise development of the drag head model by Gijs ter Meulen. The processes and forces around the drag head3 were all investigated on their cause and effect. A model was set up, where each process and their interaction with the others were identified. 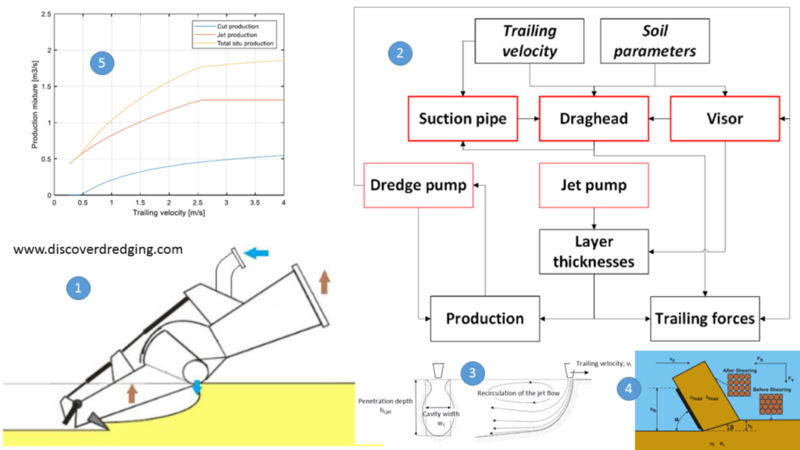 One main process in the drag head is the jetting production. A powerful jet of water is injected into the soil and this erodes part of the sediment under the drag head4. Another main process is the cutting production5. What is not eroded away by the jets, is removed by the teeth at the back of the visor. As the contribution of the processes to the forces and the production is known, the total performance can be calculated. Along the way, this gave us very useful insight in the capabilities of the drag head and the trailing system, all the way to the requirements for the propulsion. Now, we will be able to continue to improve our drag heads even further. Any other students who would like to participate in that project are welcome to contact us5. Gijs takes a new step in his career path. He is going to work for a well esteemed customer of us, so we will see him around in the dredging industry. Thanks Gijs, bon voyage! Gijs, good luck with your future career in dredging. Do you remember Ben Sloof? Our young bright graduation student presenting at the Young CEDA Pitch Talks? Last week he graduated (with honours!) 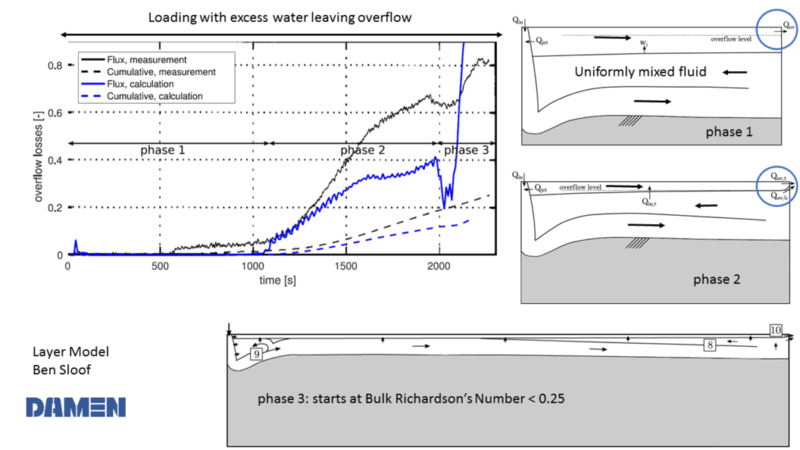 on ‘Numerical modelling of overflow losses and flow in Trailing Suction Hopper Dredgers’. You may have noticed that hopper loading was already a topic for previous posts about Ben Sloof and Jordy Boone at the CEDA Dredging Days. It results from the great interest in this part of the dredging process. And it still is a very dynamic field of research indeed, as in a short time frame various new models are presented. Who would ever think that dredging technology is a boring business? We are already dredging for ages, so what innovation could ever contribute to the progress of dredging? Well, I’ll explain what this new kid on the block found out now. Due to time constraints on a graduation project, Ben was limited to work on only a part of the hopper loading process. He worked only on the internal interface between mixture and sediment. Moving free surfaces of a filling hopper or a lowering water table from a reduced overflow height were left out of the scope. Still, it quite accurately describes the observed phenomena in the hopper loading process. 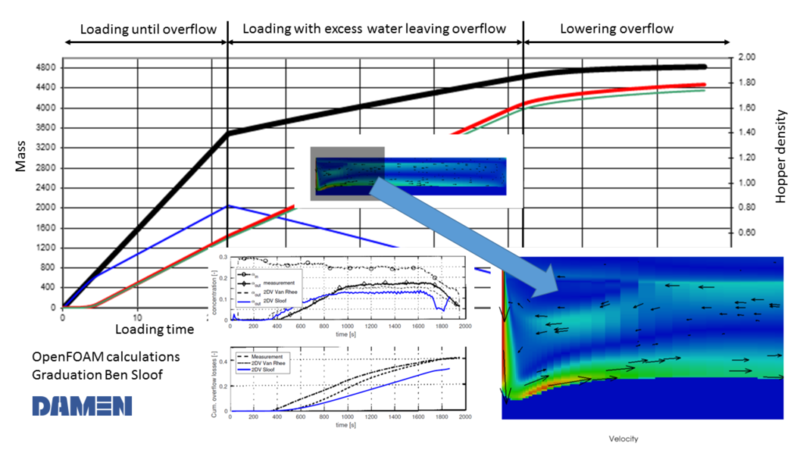 We see a negative buoyant jet, we see the jet scour pit, recirculation and mixing in the fluid body and a ‘clear’ top layer which carries away the fines as it is skimmed away through the overflow weir. Deviation from the measurements can be explained by the difference in single fraction particle size. With the observations from the CFD, Ben Sloof made his new ‘Layer Model’ with specifically a single fraction of particles. Then, he made an effort to correct the ‘Layer Model’ for physics of multiple fractions, with not too much improvement. Later on, he introduced a ‘fiddle factor’, that magically happened to be spot on. Further research and development of the model is currently under way to build a better foundation for this. Who knows, even Einstein had to introduce the ‘Cosmological Constant’ to fit his Theory of General Relativity to reality. Years later he was proved to be right1. The performance of the models by van Rhee and Boone were already discussed2. Now, the validation of the Sloof ‘Layer Model’ is also included. 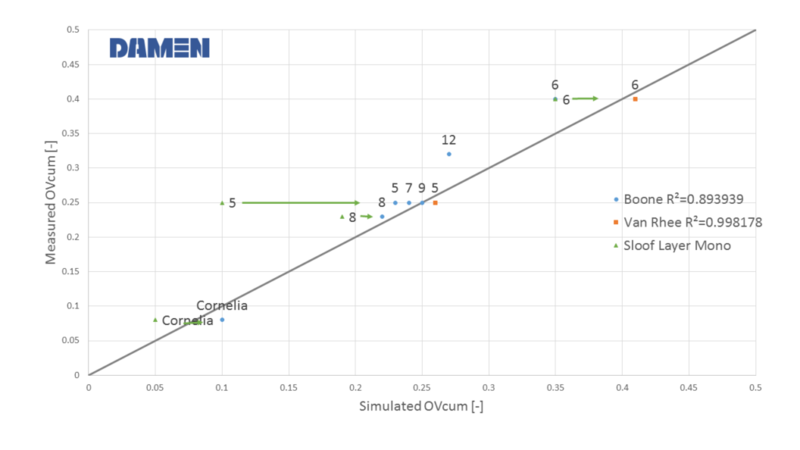 Only after adjustment for the multi fraction in the results, the model nears the performance of the van Rhee model. Difference here is calculation speed. Sloof manages to estimate the hopper performance in seconds. This is why he rightfully received his degree with honours. He improved the speed AND accuracy of the calculation in a method, that would normally take the better part of a PhD study. I am looking forward to his future achievements. Although this graduation assignment really helps us in refining our design process and gave some insight in the loading and overflow process, it still is an academic exercise. And any scientific model is just as good as the assumptions that were made at the beginning. In reality, the circumstances might be very different from what the model assumed, resulting in quit some different performance.